The best way to learn more about airgun/air rifle target shooting and becoming a member of PFTC, is to visit us during a Sunday morning club meeting. Once we have a better understanding of your aims and experience, we will offer you the opportunity to apply for membership. 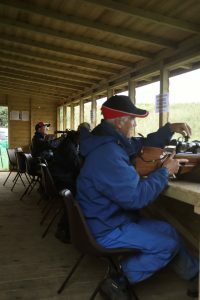 Membership of Purbeck Field Target Club is subject to a 12-month probationary period from the date of joining. A Junior member is a person aged 9 (nine) to 17 (seventeen). Junior members may only join the Club at the discretion of the Club’s committee, they will need to demonstrate that they are capable of safely handling and using an airgun and have a regular attendance over a trial period. Junior members must be directly supervised by a Parent or Guardian over the age of 21 (twenty-one) years at all times – that adult cannot shoot whilst supervising a junior. If you would like any further information please complete the contact us form and we will respond as soon as possible.